Whilst walking for some fresh air and cardio Sunday morning, I found myself jamming to the Beyonce station on Pandora, a first in a long time I will add. Now, with other stations powered by a specific artist, one will find other artists taking up residence on that channel as well. Not in this example. While I admit I did skip a few of Bey's songs, sorry girl, only once did an Alicia Keys song play and once it was Destiny's Child (It was Bugaboo for the record and yes, it was as fabulous as I remember. I also need to remember to dig out my pager from storage). Anyhow, all other songs, whether prompted by skipping or what came next, was Beyonce every.single.time. 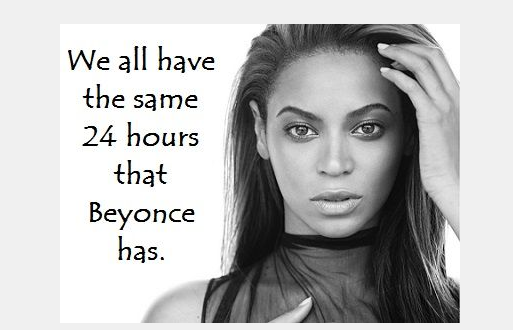 There we have it; further proof Beyonce is queen of all the lands. Just some food for thought over the weekend. And that is all for this Monday. Now, coffee. Another amazing observation to explore.